life has been crazy busy lately. these are days when all i want to do is crash on the couch and not think about dinner, dishes or chores. when life gets hectic i run straight to the freezer hoping to find some semblance of a healthy dinner - typically you will find carefully tucked away leftovers or stock piles of pesto in my freezer. 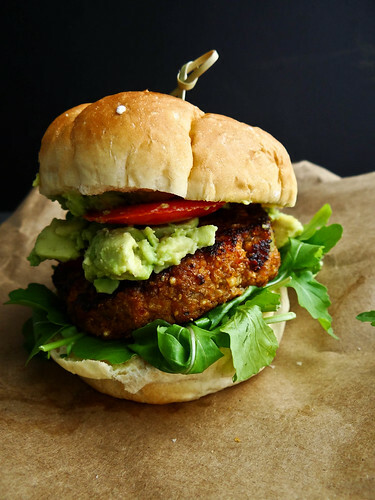 this past week i was lucky - i could say that i was totally planning ahead by whipping up a batch of these tasty veggie burgers for the upcoming week. but, the reality was it was a burger experiment that just happened to taste fantastic and freeze well. this is also a burger that Justin wouldn't touch with a 10 foot pole - pay no attention to him, he is weird. so that left me with 4 burgers all to myself - which ended up being a quick and east lunch/dinner for me a few days last week. 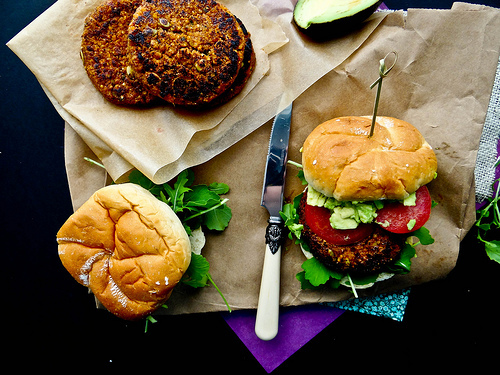 this is a bean free burger - gluten free too if you swap out the wheat germ for gf oats. there is all kinds of goodness in this burger - sweet potatoes, mushrooms & millet are the base. dates and maple syrup add a hint of sweetness which is a nice contrast to the smokey chipotle. lime, cilantro and cumin add another layer of flavor, bringing these burger to whole nother level. 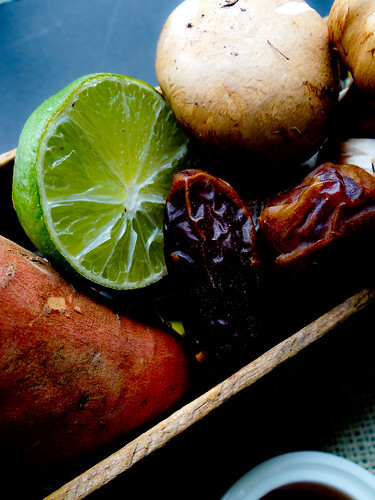 the sweet potatoes are steamed and whirled in a food processor with the mushrooms, dates & chipotle. then mixed with a bit of wheat germ, lime, cumin, cilantro, salt, maple syrup, millet and Pepita's. in a medium pan, the burgers are pan seared with a bit of canola oil, then baked in a pre heated 350* oven. 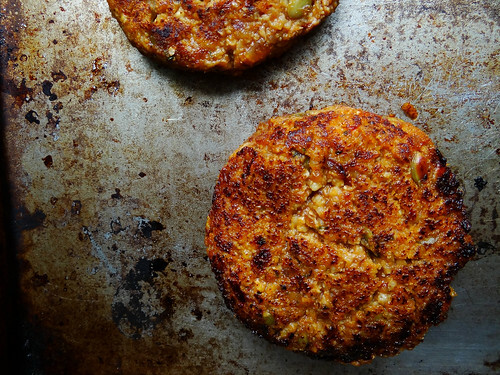 baking firms up the burgers versus just straight up pan frying. my burgers where served up with a layer of mashed avocado, local arugula and sliced tomato.two words for you - incredibly amazing. these burgers freeze well and reheat beautifully. i have cooked these on the grill with a slice of tin foil under the burger lightly sprayed with canola oil. they also reheat nicely in the toaster oven. 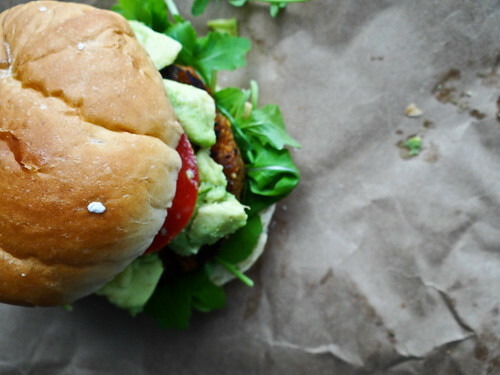 i am planning on making another batch of burgers for this weekend - we have 2 BBQ's to attend, these are going to be perfect for my vegetarian and vegan cousin's and sister.this time around i will make up a vegan gluten free batch with gf oats and sub in fresh cilantro for the dried. 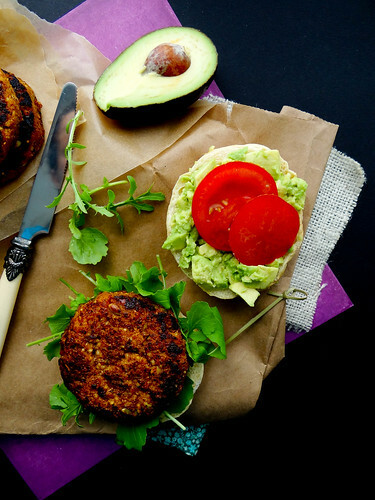 tell me, what's your favorite veggie burger recipe? with my first successful veggie burger recipe under my belt, i see many more homemade veggie burgers in my future. in a small sauce pan bring water to a boil, add millet, cover and cook for 15 minutes until water is absorbed and millet is cooked through - remove from heat and cool. 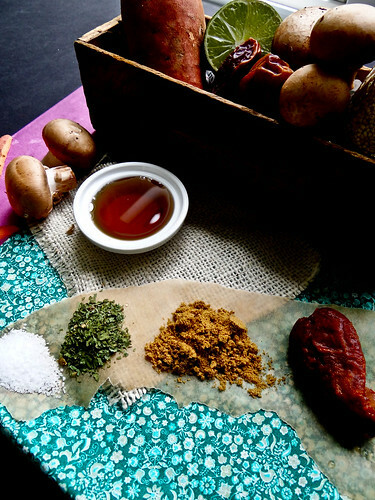 in a food processor fitted with an s blade, process sweet potato, mushrooms, dates, chipotle pepper until mushrooms are finely diced. 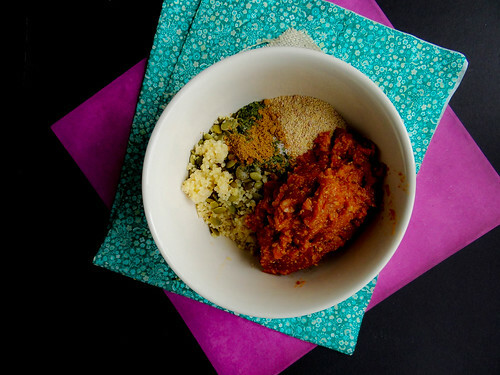 in a medium bowl add sweet potato mix, cooked millet and remaining ingredients - lime through Pepita's and mix well. divide the mixture into 4 even mounds. form each mound into a patty and place on a baking sheet. in a medium fry pan, heat a tsp of canola oil over medium heat. 1 patty at a time pan fry in oil until each side is golden brown. transfer back to the baking sheet, continue with each burger. 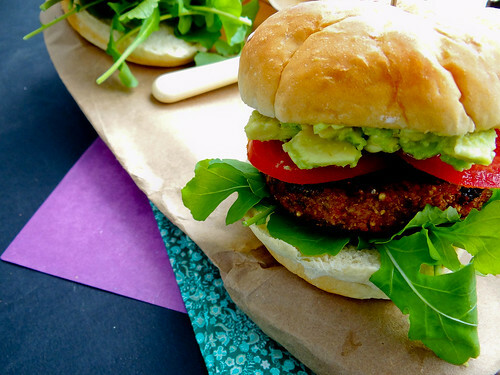 remove from oven and serve on a bun with mashed avocado, arugula and slice tomato. to freeze for later, layer burgers between wax or parchment paper and seal in a Ziploc bag. reheat on the grill, stove top or toaster oven until warmed through. What a delicious looking recipe. I always made the classic bean burger. I can't wait to change it up with your recipe. You always have so many great ideas!! Thanks Lysa! ....sometimes beans and I do not agree, so I was on a mission to make a Bean Free Veggie burger, this was a total success! omigosh, these burgers look off the charts amazing. i've been feeling very similar lately, too. i feel like i am constantly running around like a lunatic and have no time to relax.. Thanks Ella - all the flavors work so well together,I love sweet and savory together! Ah, Justin doesn't know what he is missing. The paper bag makes it even more appealing to me. I think I'll give these a whirl. Thank you for posting. You are so right GiGi, he totally doesn'y know what he is missing considering he didn't even try a bite :) More for me!! Anytime I make veggie burgers or patties, I store the leftovers in the freezer because they make a quick and easy dinner any time I don't feel like cooking! 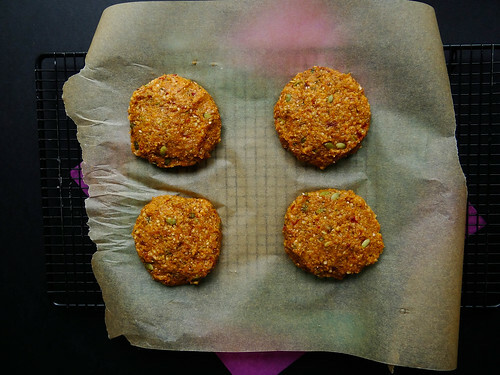 These burgers sound very tasty..I've seen lots of veggie burgers that use cooked quinoa but the millet is a great idea! now this is what i call the perfect summer burger! what! justin doesnt like these! i cant believe that. love the dark background. it just pops everything right out of the screen! Meat loving BBQ's are tough, I always come prepared with good eats "just in case"
this looks so delicious! and perfect timing before all the Memorial Day BBQs!! your pictures are fabulous!! they could be an advertisement!! haha! thanks for the recipe! As soon as i can eat sweet potatoes again, (i'm on the Body Ecology Diet right now) I'm totally making these! Awww thank you, you are the sweetest! I am looking up that Boby Ecology Diet, sounds interesting! This does sound great--especially with the maple and chipotle combination! Sweet and spicy--perfect. I have gotten out of the habit of making veggie burgers, but I think I'm going to need to get back in! I love sweet & spicy it is one of my all time favorite flavor combinations :) I need to get into the habit, and this has gotten me hooked on making my own! 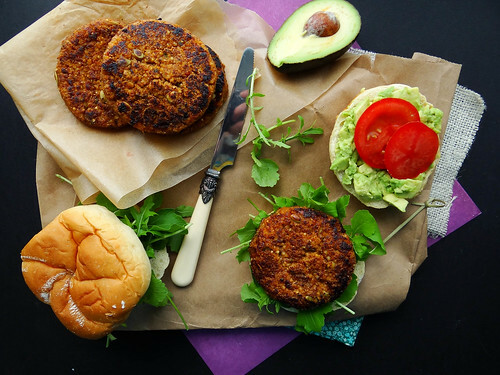 Seriously though, I love sweet potato burgers, I love maple and I love the heat of chipotle- these burgers sound WONDERFUL! Haha I would if I texted :) - they were pretty wonderful! Those burgers are so perfect looking! And the flavour combination strikes me as a winner :) I am absolutely bookmarking these for next weekend- I CAN'T NOT make these now! Total winner Gabby! ...poor Justin, if only he would have at least tried a bite - maybe I can convince him this weekend! What's up with Justin? These look RIDICULOUSLY satisfying! I can imagine making a big mess all over my face (and likely my shirt) while I try to devour it all in one bite. I love the combination of maple, chipotle and sweet potato, covered with mashed avocado! Awesome! Oh Justin, he is a little hesitant about trying new flavour combinations - I totally inhaled this burger after I was done shooting....I didn't want to take a bite for fear I wouldn't put it down! The avocado totally bring these to a whole nother level! What a great combo of flavors! Love your pictures too, the colors are so bright and delicious looking! I'm glad that Justin doesn't like these because that means there's more for me :) I'm squealing right now--veggie burgers are my thang! Thank you - if you do try it let me know how it turned out! 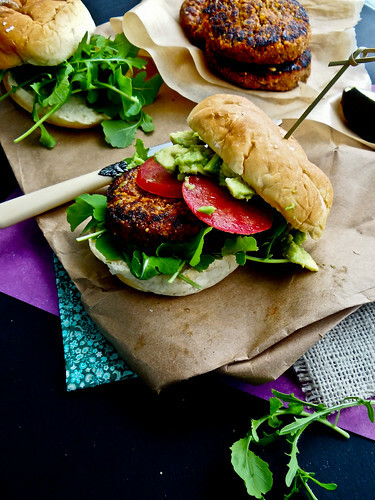 Yum - I am always on the hunt for new and interesting veggie burgers. I can't wait to try these! Thanks Julie! 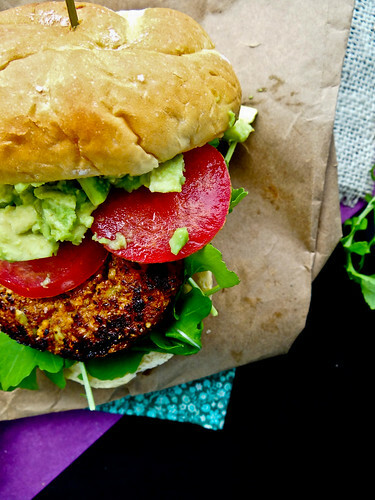 I too am always looking for new veggie burger recipes - the possibilites are endless! I am really liking the sound of these burgers! Crazy right! First attempt, veggie burgers use to scare me - I made these this weekend for my Sister and Cousins and they loved them - My aunt and snuck a bite of my sis's and couldn't believe the flavors! Yum, I love this combo of flavours, very nice! Thanks Erin, I love Chipotle and Sweet Potato togther, it is one of my favorite flavor combinations! Chipotle and sweet potato strike me as a great combination. I never would have imagined them together in the form of a burger.. yours looks absolutely delicious! These look incredible!!!! :) YUM!!!!!! 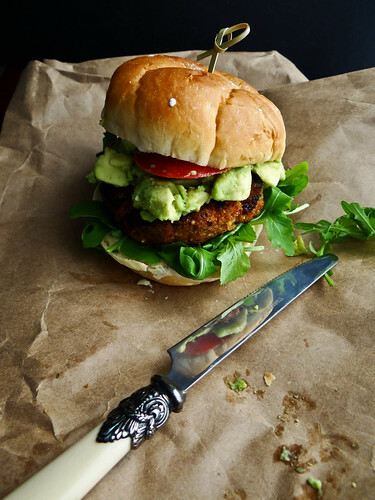 You were so my inspiration to even attempt to make a veggie burger! WOW, WOW, WOW! THese look and sound AMAZING!!!!! Definitely making these, love your photos too...drool!!!!!! Thanks Nora - it puts a big smile on my face to read your comment, I love your blog!